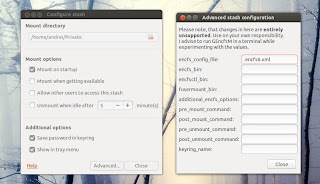 Gnome Encfs Manager (GencfsM) is a tool to manage EncFS filesystems. The tool is a great alternative to Cryptkeeper (but with some extra features), which can't be used in Ubuntu 13.04 unless you install a patched Unity to support the old systray whitelist. EncFS provides an encrypted filesystem in user-space and the files are encrypted using a volume key stored encrypted in the source directory. This can be used, for instance, to encrypt a folder with confidential data in your Dropbox (because for instance, Dropbox doesn't encrypt the data on your computer) - more about this, HERE. 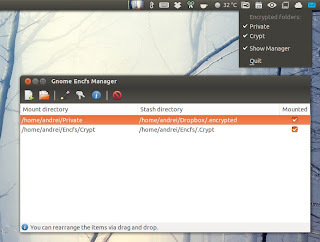 Gnome Encfs Manager can be used to create, mount and unmount EncFS folders and comes with GNOME Keyring and Ubuntu AppIndicator support. Also, the applications can mount EncFs folders at startup, useful if you use EncFS with cloud sync / storage services such as Dropbox or Ubuntu One. 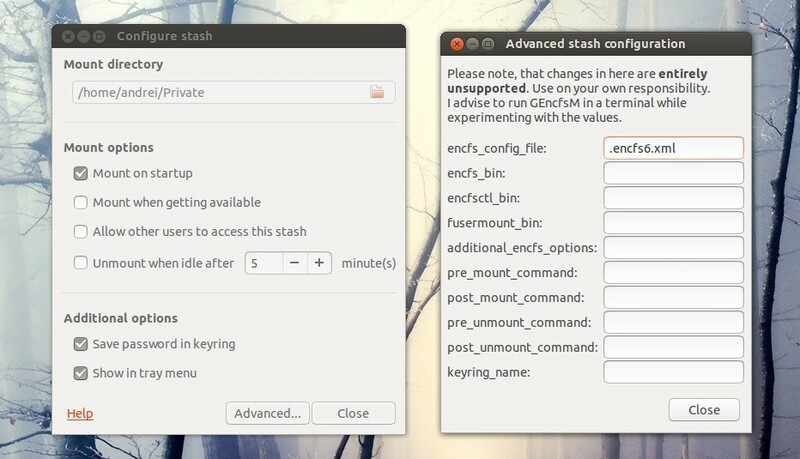 Other Gnome Encfs Manager features include: allow other users to access the stash, unmount after a certain number of idle minutes, as well as some advanced options like post mount or pre mount commands, set the encfs config file and more. To download the source code, report bugs and so on, see the Gnome Encfs Manager Launchpad page.